This is one of the more expensive rooms to renovate in your home, so it is very important to get it right. The common thought on this is to opt for something very neutral that you will not tire of. Now this is totally understandable but don’t be prepared to rule colour out completely, because if you are a colour lover, then chances are you won’t get sick of it. 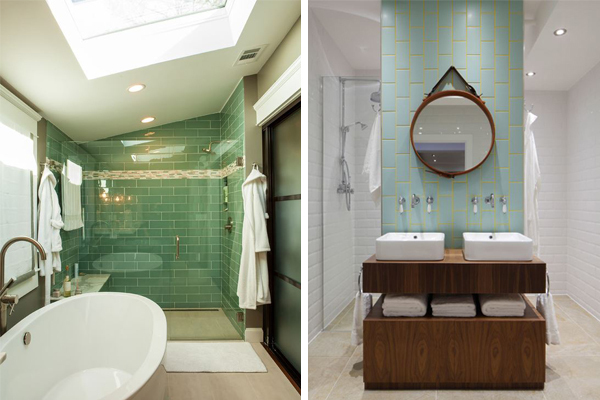 So, I want to show you some neutral bathrooms, that still have interesting elements, and then some braver bathrooms that have injected some colour. 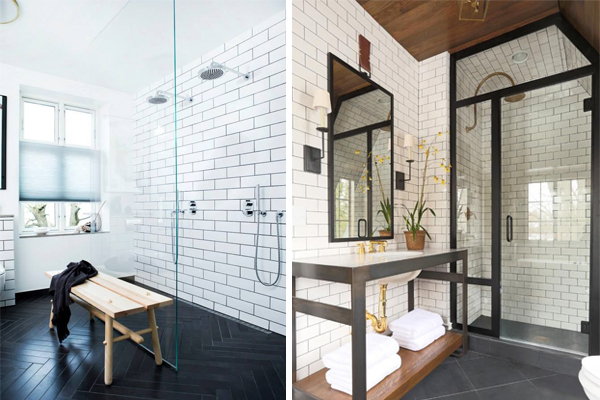 I wanted to concentrate on subway tiles this week, as there are some whispers out there that people are getting sick of these beautifully classic tiles, and i want to prove them wrong….. The trick to using white tiles whether they are subway or not is to create an interesting contrast. I particularly love the use of bold graphic tiles on the floor (above). Grey is a nice compromise if you don’t like the idea of white but you are just not prepared to go all in colour. 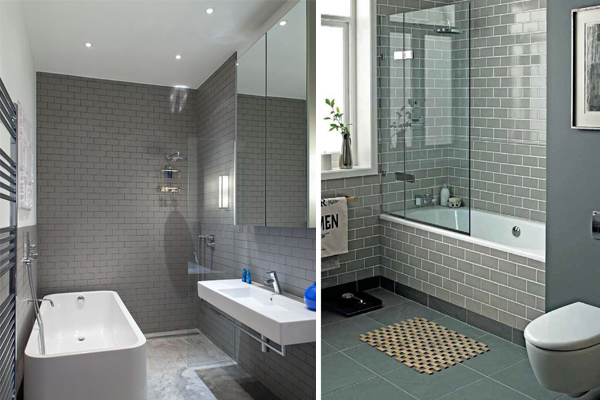 Be sure to select a warmer grey tile however, as if you are living in Ireland cool greys don’t really work with our climate. I really love the subtlety of the green tiles. They are not overpowering and create a calming feeling. Just perfect for the bathroom. Check out the yellow grout in the image on the right. Amazing!!!! 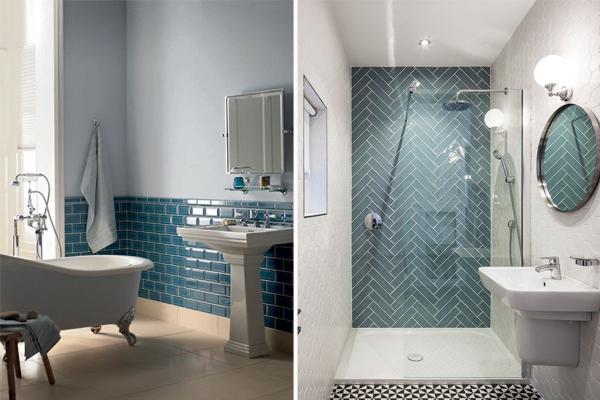 Blues and Teals are very popular right now and its easy to see why. 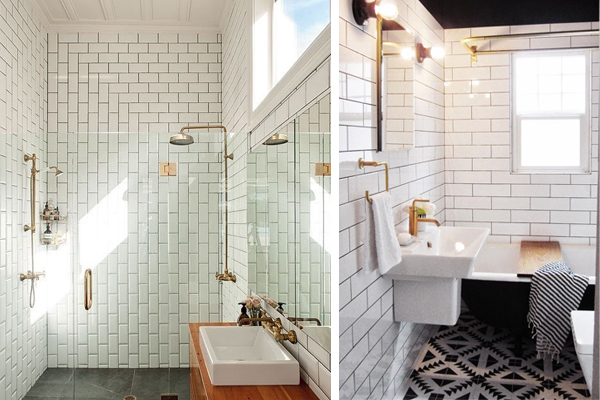 What I really love about this bathroom (above right) is that the tiles are laid in a herringbone pattern. Such a beautiful contrast to the other tiles. Just to note that if you do wish to lay your subway tiles in this pattern then you will need the tiles to be longer than the standard subway tile. If you are considering a bathroom revamp over the coming months, then I hope I have given you some food for thought.